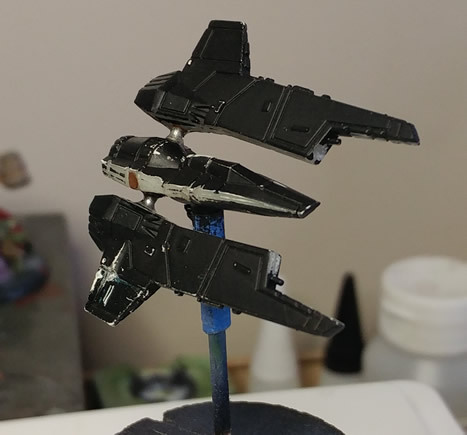 As a reminder, my primary project are the Hordebloods, so the repainting of this fleet is just a quick tabletop quality process. Definitely comes together well though and I'm a big fan of the contrast between the dark greys and bright greens. While this is a quick tabletop goaled process, I think you could still apply the tactics to your own black and white painting. 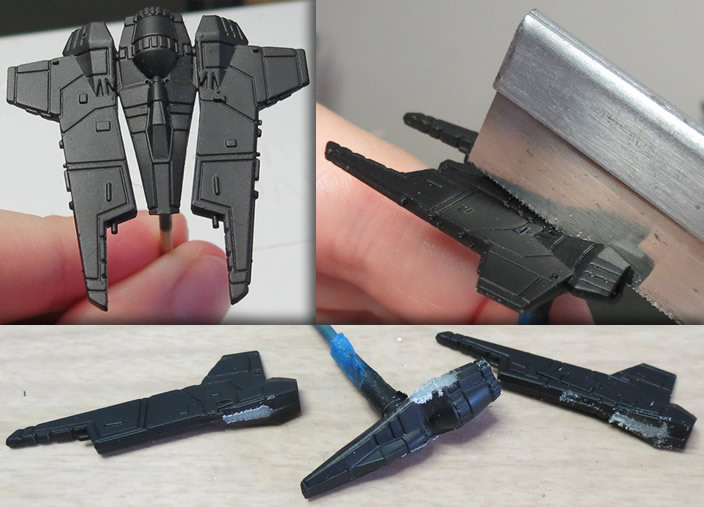 Also, I painted the greys using an airbrush, so this might not be something everyone can emulate exactly - but you could do something similar using dry brushing. So in the photo below, you'll see the progression of how I've painted the ship's hull. 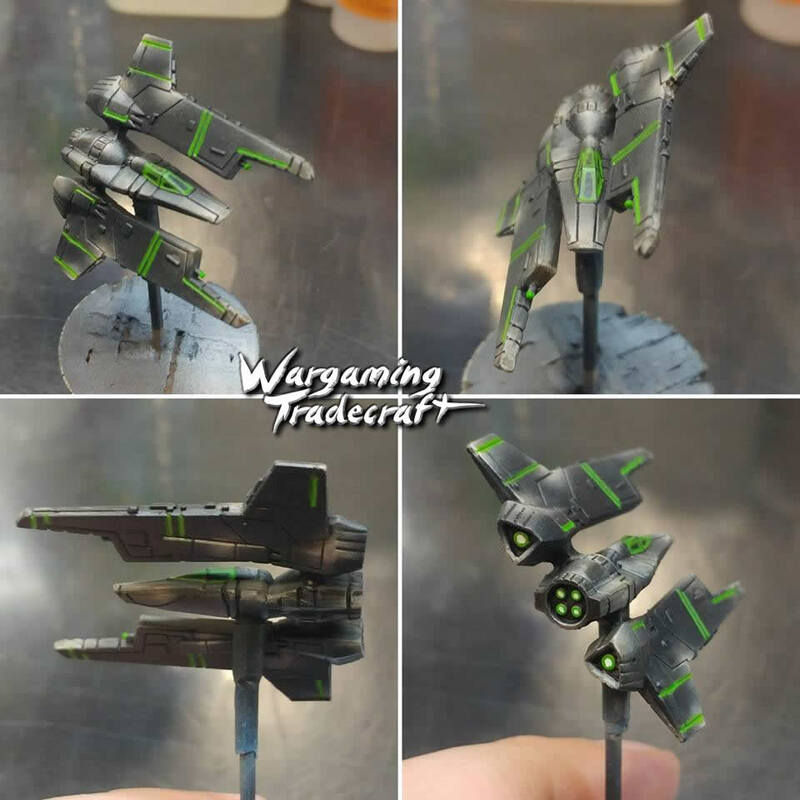 The first photo (top-left) is the ship primed black. 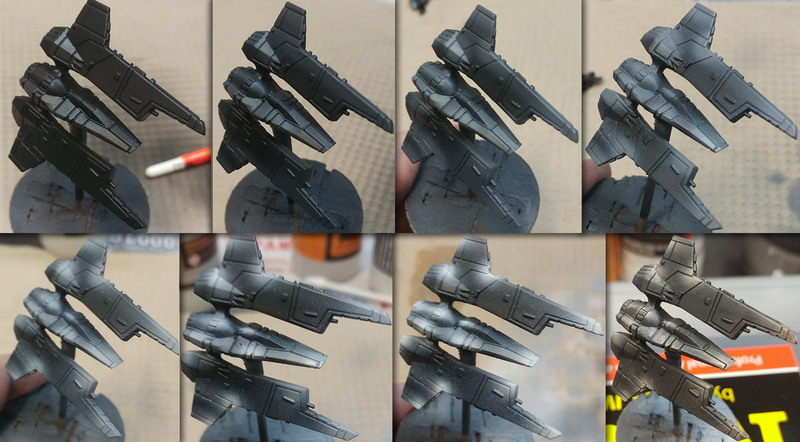 The next photos show the progression of quick airbrushed highlights. With black paint in the airbrush cup, I add a little bit more white for each step. In the final highlight step, I clean the airbrush so I can highlight with just white. 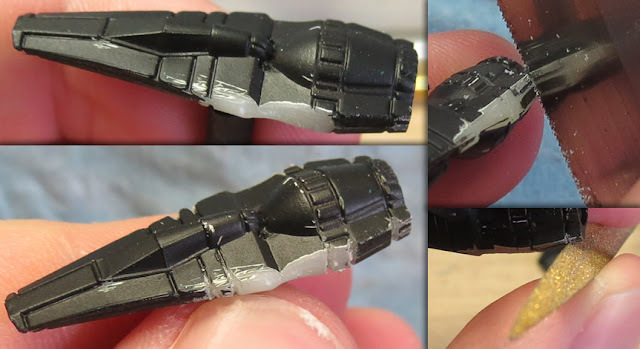 When I'm highlighting, I cover more area with the darker greys, working into smaller areas with the light greys / white. The final photo (bottom-right) is the ship washed black. I've done the same to the bottom of the ship. I really want to point out how a wash does an excellent job of blending and tying the ship together. Really quick, I paint the glass black. Then, I thin some bright green paint with some slow dry medium (you could use water) and run it around the edges of each window. I clean up the supports around each window with some grey so it stands out from the green. Finally, I paint some Liquitex Gloss Varnish on the windows themselves. 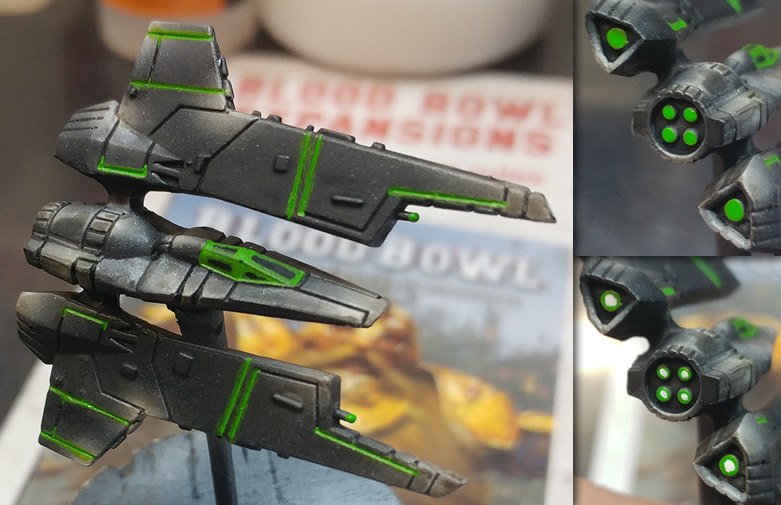 The cracks between hull plates make it really easy to paint green accents in. Similar to the cockpit, I've thinned the paint down so it really flows and just run the brush along the cracks I want to end up green. It takes a few layers to get the full brightness, since I've thinned the paint down, but it gets there. For the gun barrels, I've just dabbed some bright green on the tips. To paint the engines, again, just green dots, but I've also centered white dots as well. And below you can see how the ship turned out! I really like how it looks! So the Mandalorians really get their background expanded and eventually have these ships introduced. What's neat is seeing their wings spinning around their cockpits as they dogfight, similar to B-Wings but centered. I've used my jewelers saw to cut the wings off the ship. You could use a pair of snips, but it wouldn't be as clean. Even then, I still use a knife to clean up the areas I've cut and smooth it out. There's also some detail lacking on the sides, especially where the wings were cut off. If you look below, in the top-left is the before and bottom-left the after, with the pictures on the right showing how I carved some of the detail back into the ship using the saw and a file. First thing I do is find the place on the wing for where the hold should go. The easy way, is to put a large drop of paint on the body of the ship, then press the wing against it where it would line up. Now you have a dot on the wing where you can drill. Start drilling using a knife to press a dimple into the plastic for the drill to sit in. Then, drill the wing and through the body. You can use a regular drill if you're verrrry careful, or a pin vice to be safe. You can then run a pin through the body and glue the wings on as well. Because it's pinned to a wire, you can press and pull the wings in until they're aligned cleanly. The wire doesn't work as a final piece, and still might bend, so I've covered it up with a little bit of greenstuff.